When choosing a wedding dress there are lots of things to consider, the most important is comfort. We all have areas of our body we are conscious of or want to accentuate and a short wedding dress is great for this. Our stunning vintage style wedding dresses can accommodate any brides needs as they are so versatile. We’ve put together some of the areas and the best retro short wedding dresses to wear. Our brides can choose different looks from our designer short wedding dresses. If you want to show off your shoulders and arms then a dress like Matilda by Timeless Chic is fantastic. It has a gorgeous lace sweetheart neckline which softens the bodice. Showing off the shoulders and neck give the illusion of length. The full tulle skirt has a wonderful flow to it. A stunning vintage style wedding dress that has the wow factor. If you feel more comfortable with your arms covered then there are all different lengths to go for. They can also be made bespoke to a brides requirements. Dora by LouLou Bridal is a fantastic vintage style wedding dress with 1/2 sleeves. The lace overlay flows over the bodice and back (but can be removed for an open back). The sleeves have a pretty scalloped edge to finish off the overall look. We love a sweetheart neckline and this is a great look for most brides. It has a fitted bodice which is very flattering. If you have a larger bust and feel you are conscious then an illusion neckline is great for this. Mae by True Bride is part of the Brighton Belle collection. It has a pretty Illusion neckline finished in applique detail around the edges. It’s a real retro wedding dress with lots of fine details. 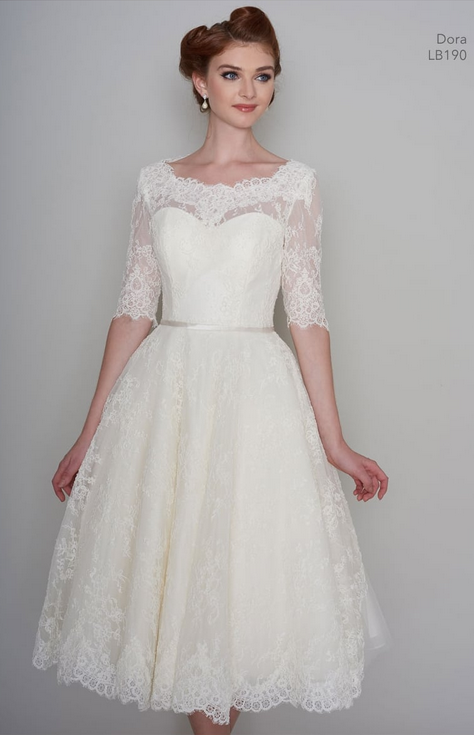 The sweetheart neckline is covered in lace that trickles down onto the full 1950s skirt. For smaller busts then an off the shoulder look is great or wonderful deep v backs look amazing. Also a bodice with lots of detail is great and Bella by Loulou Bridal is a great example of this. It’s a gorgeous vintage inspired tea length dress with ivory corded lace over pale blue, trimmed with a narrow satin bow belt. The back of the dress has lots of detail too which is simply stunning to look at. The blue coming through underneath the lace panels on the skirt really set this vintage style dress apart. If you want to show off your back in your vintage style wedding dress then we have a dress for you. Go for a wedding dress with a deep v at the back as this will really accentuate your back and it becomes a focal point. On the other hand if you are feeling slightly conscious of your back choose a higher neckline. 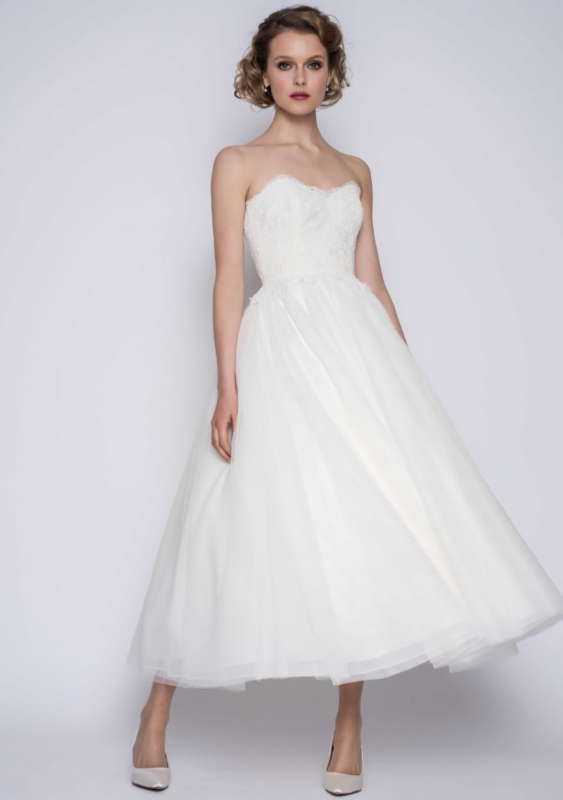 A gorgeous short wedding dress such as Nellie by Loulou Bridal will be great. If you fall in love with a dress that has a lower back than you had originally wanted you can have it made bespoke. Our gorgeous bride Maddy chose Nellie by Loulou Bridal and it had a low back but she felt a little exposed. So our seamstress altered the back for her to cover her full back in the polka dot material. She also had the sleeves made longer to 1/2 length which made the vintage style wedding dress unique to her. Short wedding dresses can be fantastic for showing off your legs. Our retro style wedding dresses are available in a variety of lengths. They can also be custom made to any length in between too. If you still want to wear a tea length wedding dress but feel a bit conscious you can wear a High Low wedding dress by Timeless Chic. Ivy Lace has a sweeping hemline that is shorter at the front than the back. It gives this vintage style wedding dress a gorgeous train which really delivers the wow factor. It’s finished with a wide satin sash and bow detail at the front. 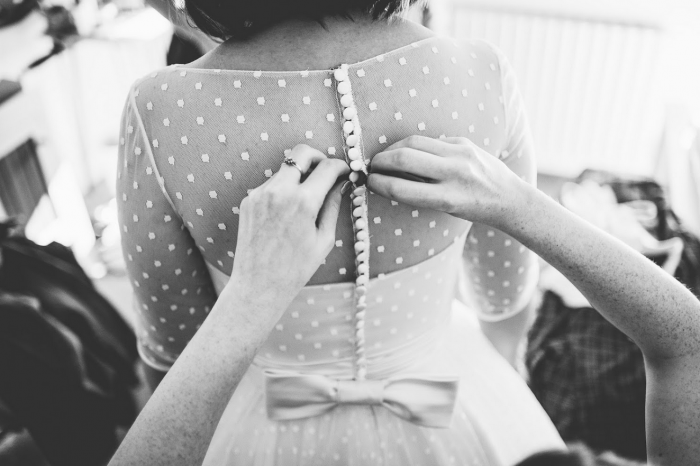 We would love to help you find the perfect vintage style wedding dress for your shape. At your one to one appointment, one of our highly trained consultants will help you find your style. You’ll get the chance to try as many short wedding dresses as you like. There is no pressure and you’ll be able to make the dress totally bespoke if you can’t find exactly what you want. Give us a call today or contact us via the website.